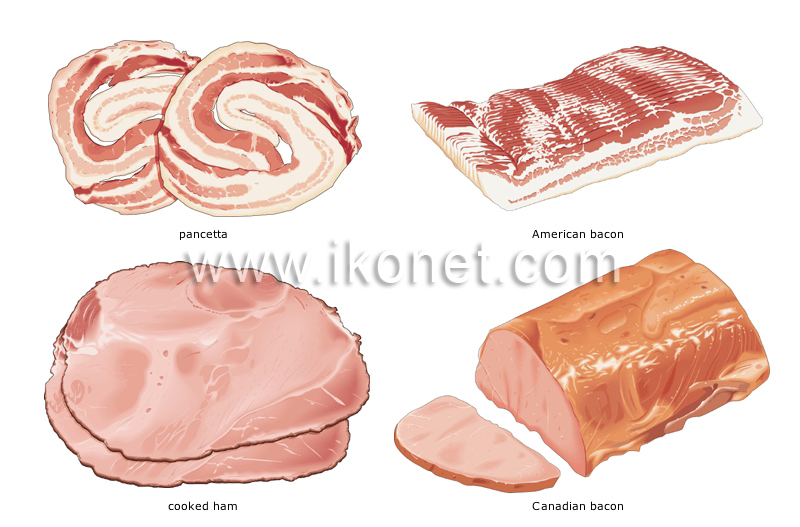 Piece of salted, usually smoked, meat from the pork loin; it goes well with eggs and in dishes such as quiches and omelets. Salted and smoked side pork, cut into thin slices; in North America, it is traditionally served with eggs, for breakfast. Rolled Italian bacon, sometimes spiced; it is an essential ingredient in pasta alla carbonara and also flavors sauces, soups and meat dishes. Salt-cured and cooked pork meat, usually served thinly sliced; it is eaten hot or cold, especially in sandwiches, and on croque-monsieurs and canapés.